Join us on GRAVEL and experience the charming town of Dufur. Follow the mighty Columbia River to The Dalles then drive south for 13 miles and you’ll come to the small farming community of Dufur, Oregon – population 615 at last count. The town itself is plotted on just shy of half a square mile of land, complete with a quintessential small town Oregon Main street lined with historic buildings. 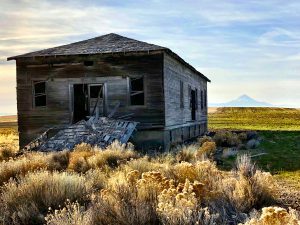 Outside of town, the landscape is sparse but dramatic, with golden hay and wheat fields, fruit orchards, and rugged high desert expanses punctuated with Mt Hood looming 25 miles due west. Dufur was founded in 1893 by two brothers who raised stock and grew to include a tight knit farming community. The town really hit its stride around the turn of the century. Dufur briefly held the distinction of having the largest dry-land apple orchard in the U.S. and when the Southern Pacific Railroad came through, linking Dufur with The Dalles, both towns were thriving. The Balch Hotel (1907), the Schreiber House (1900) and Kramer’s Market (1905) were all built around this time and have been nicely preserved and restored for people to continue to enjoy to this day. Much of the town’s identity seems to come from its close ties to the past. Exploring the back roads around Dufur (like we will do on this year’s GRAVEL event) you come across quite a few old weather-beaten wooden structures – some were school houses, some were churches, some were homesteads, some were all of the above. There’s even a wooden granary from 1883 still standing over Fifteen Mile Creek in nearby Boyd. Shutterbugs come from all over to photograph these small structures to document the slowly fading history and as a reminder of how people lived not so very long ago. Another great reminder of the town’s heritage is the annual Vintage Dufur Days celebration (formerly known as the Threshing Bee). During the second full week of August the community holds a parade, and then they fire up the old-time harvesting equipment to demonstrate how hay was threshed and fields were turned back in your great grandfather’s day. Fun times for all! 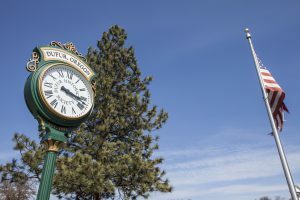 If you’re visiting Dufur at another time of year, don’t worry, there is still plenty to see and do. First of all, if you’re trying to escape winter gloom, Dufur has over 300 days of sunshine a year! It’s a good thing too since there are endless outdoor activities to do in the area. There are miles and miles of low traffic, scenic roads to explore on bicycle or motorcycle and being located just 15 miles from the eastern border of Mt Hood National Forest makes Dufur an ideal starting point for snowmobiling or elk hunting. If you’re a fan of water, you’re in luck. The Deschutes River is 40 minutes south with some of the best fishing and white water rafting in the northwest. 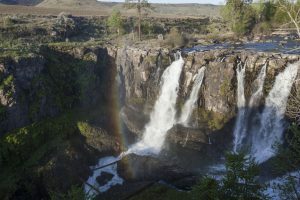 Sherars Falls, near the town of Maupin, is on a section of the Deschutes where you can watch Native Americans pull salmon and steelhead out of the river from scaffolding above the falls, just like their ancestors have been doing for hundreds of years. Another great waterfall in the area is at White River Falls State Park, just 15 miles outside of Dufur on Highway 216. These beautiful falls cascade 90 feet over a basalt shelf on their way towards a historic hydroelectric power plant. This park is a great place for hikes, picnics, wildflowers and history. 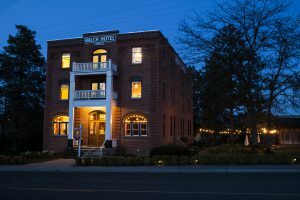 If you plan on staying in Dufur, you really can’t beat the Historic Balch Hotel. Completely restored down to the very last piece of crown molding, this 1907 labor of love is now an 18-room bed and breakfast. It also happens to be very bike friendly. And since ya gotta eat, the also historic Kramer’s Market is just down the street. Kramer’s has been the local store in Dufur since 1905 and they fill the needs for a grocery store, a deli, a restaurant, a butcher shop and a place for the locals to gather. And for the slightly more indulgent things you crave when you’re visiting a new place, there’s WE3. Get your fancy coffees, your ice cream treats, your baked goodies and a real honest feel for the community. And they have free wi-fi, so maybe stay until you’ve had a chance to research your next excellent adventure in the area. The Balch Hotel also offers dining options. A Light Fare menu and weekend dinner specials.